Laurie Jaffee and Weichong MarwingMr. Jaffee was a true inspiration for us all. He called me shortly after I was appointed with this post and said: “Son, the game will go on, with or without us, but while we here, let’s make it better for everyone.” These are words that will stay with me forever. I want to thank him for everything that he gave the industry and we already miss him here at the offices of the RA. On behalf of the Directors, staff and members of the Racing Association, our deepest sympathy to Mrs Jaffee and family. A truly great icon has been lost, boots that can never be filled, but we have been privileged to have known and shared a moment with this true gentleman and sportsman at some time or other. Mr Jaffee I will always remember you for your wisdom and commitment to our industry, a man that was a true asset to racing as well as life. Rest in peace sir. My deepest condolences to Mrs. Jaffee and family. I first met Mr Jaffee when I was about 18 years old and what impressed me most about this colossus of a man was his humility despite his success in three separate walks of life namely, racing,business and as a man of the utmost integrity. That didn’t mean that he didn’t know how to drive a hard bargain and I often recite the following incident with fondness: Mr Jaffee would call to have a bet and after exchanging pleasantries for a few seconds would ask what the spread was on the SA vs. Aus game that weekend.I would say they are betting 9/10 the pair SA +7 Aus -7.He would immediately and without hesitation say that his mate in Aus would give him even money and + 8 SA. The thing is that Mr Jaffee wasn’t interested in the money but more in the negotiating the price,that gave him far more satisfaction than winning the bet, so inevitably he always got the price he wanted. He was a character,a gentleman and above all a true sportsman which I will sorely miss and so will racing. Our sincere condolences to Mrs Jaffee and the family. Ps. True to his character he never backed against SA no matter how poorly we performed! Mr Laurie Jaffee will be sadly missed by each and every person in the racing industry. - Ronnie Hamilton Dear Clyde, As you say he was a wonderful man and his zest for life and interest in racing was immense. He was very happy with the changes you and your team have introduced at Turffontein. The last time he raced at Turffontein was a very happy day for him and he was pleased that you came and chatted to him. Keep up the good work. It is with deep regret that we hear of the passing of a great man. An icon in the Horseracing Industry in South Africa and Internationally. A thorough gentleman with a charitable heart of gold. For many, many years Laurie and Jean have been fantastic supporters of Western Cape Racing and the Western Province Owners’ and Trainers’ Association. We would like to touch on some of the memorable times in Racing with our dear friend Laurie: Laurie and Jean meet for the first time at the Savoy Hotel in London in 1955. They got married and headed to South Africa where Laurie had a business. The Horse Racing journey begins as an owner, breeder and administrator. The first time the famous racing silks were seen on the Racecourse in August 1959, on the horse Sir Isaac – Laurie and Jean’s Red, White and Black Diamonds. First Racehorse winner – Ladkin in June 1960. He became a Member of the Turffontein Racing Club in 1963, was elected Race Club Steward and Jockey Club Executive in 1973, became Chairman of Transvaal Racing Club and the Johannesburg Racing Club in 1982. Many good horses passed under the ownership of Laurie and Jean Jaffee and their partnerships – to name a few: King’s Guard, Bush Telegraph, Statue of Liberty, Beyond the Pale, Lester’s Choice (named after Lester Pigott), King’s Rhapsody, Mrs Pankhurst, Hancock Park, White Tie Affair, Ton Up, Flirting Prince, Voodoo Charm, Arctic Cove, Petrava, Lord Randolph, Potomac, Mark Anthony, Castle Walk, Illustrador, Jallad, Faralmond, In Camera, Promtisimo, Hoeberg, Eventuail. THE GREATS: Empress Club and London News. A few years ago Laurie was named the first “Owner of the Year” in South Africa at the Equus Awards. What more can anyone say about a great man who lived his passion to the fullest. 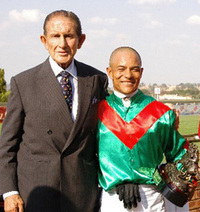 Laurie will be sorely missed by all of us in Racing in South Africa and around the many famous racecourses of the world. “AND AWAY THEY GO.” Our sincere condolences go to Jean and the entire Jaffee family.